Ben Parker said that to his nephew, Peter Parker, more commonly known as Spiderman. It’s not just true for Superheroes though! Now that I have a decent HF amplifier and am capable of running the UK limit of 400 watts, I decided some time ago that I’d like some decent test gear in the shack which can manage the power and which will also help me keep my signal as clean as possible so I’ve been buying stuff over the last few months. Firstly, to make sure that I don’t run too much power and to give me an ‘always on’ easy visible check of aerial SWR, I started looking at good power/SWR meters and decided to buy an Array Solutions Power Master II. The meter doesn’t come cheap but when I compared it to a Bird model 43 with a set of slugs to cover the same frequency and power levels, the price was pretty close and the benefit of the Power Master is that I don’t have to faff about swapping slugs, it just does everything. So here’s the display section of the meter sitting in my shack, you can see I’ve used the supplied software to customise it with my callsign. My amplifier front panel isn’t easily visible from my operating position, I have to swivel and move to get it into view so it’s very handy to have the Power Master II always in view. It’s also nice to know that both meters read pretty much the same power. You can see I’ve not taken the protective plastic off of the meter yet! I used the Power Master II to produce the VSWR graphs I posted here. I took a reading every 10KHz and plotted the graphs using a spreadsheet. It took a while to do it and it was really quite tedious to do so. When I’ve done aerial work before I’ve always borrowed an MFJ analyser from a friend but I wanted my own analyser. 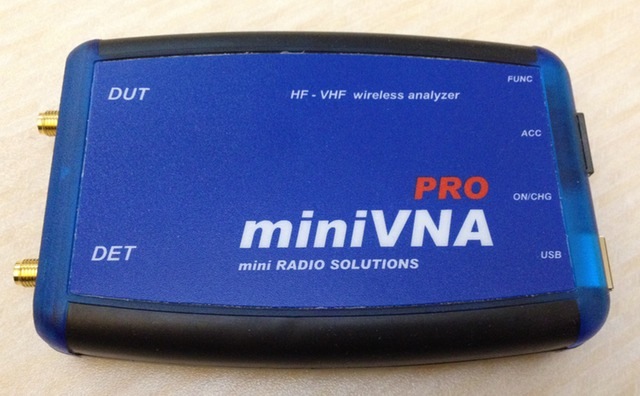 I spent some time looking on the market to see what’s available and settled on a mini Radio Solutions miniVNA Pro. It doesn’t have the portability of some of the analysers but it will do so much more. 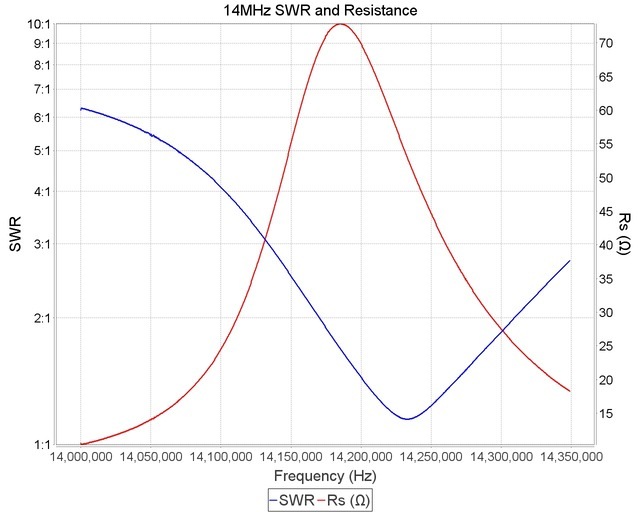 The documentation is a bit sparse and at the time of writing, all I’ve done is produce SWR graphs of my aerials but I’m planning on using it to test the ADSL filter I built when the parts I’ve ordered to put some probes together arrive. It’s already proved very useful though when I recently retuned my Cushcraft MA-5B to the SSB section of the band. It only takes a few seconds to produce a nice graph like this. 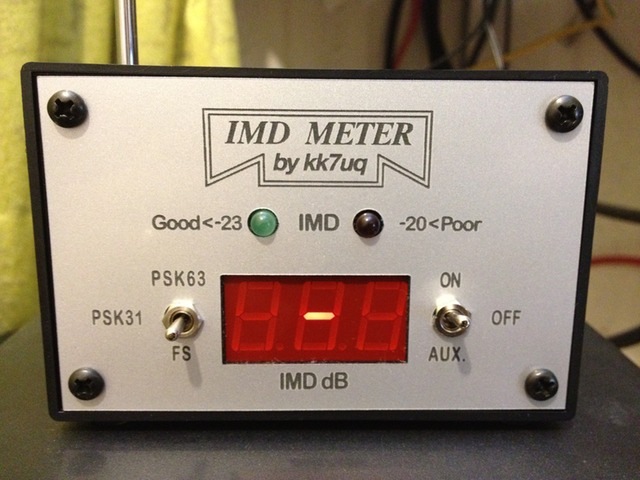 The third piece of test gear I’ve recently bought is a KK7UQ IMD meter. This meter is invaluable when running PSK31 or PSK63 as it’s very easy to overdrive the PSK modes and transmit a wide and noisy signal. It monitors a transmitted signal and gives an IMD report to indicate how clean (or otherwise) the signal is. No more adjusting audio levels by guesswork. I was disappointed to discover that the meter was no longer available in kit form so I had to buy it fully assembled which was a shame as I’d have liked to have built it. 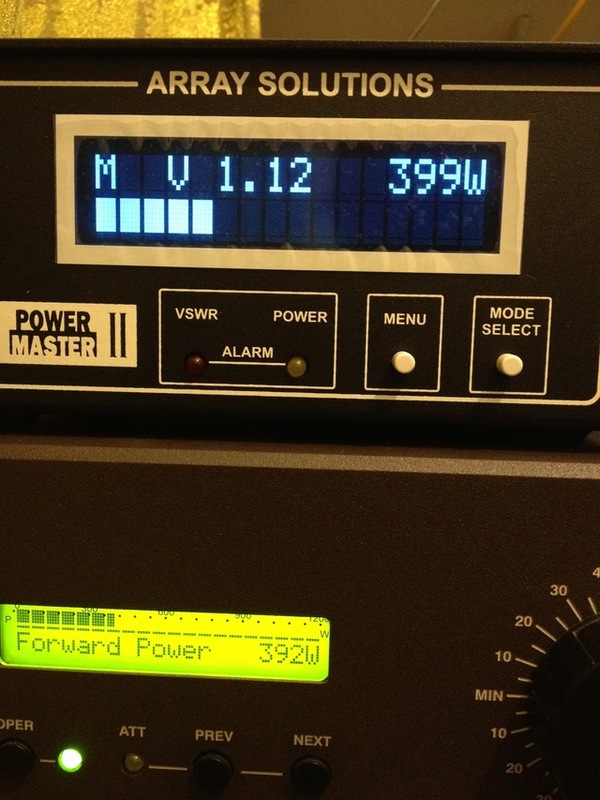 The PSK modes are traditionally run using low power – When I’m operating PSK normally I don’t run more than 20 watts or so but during a contest I like to wind the power up. 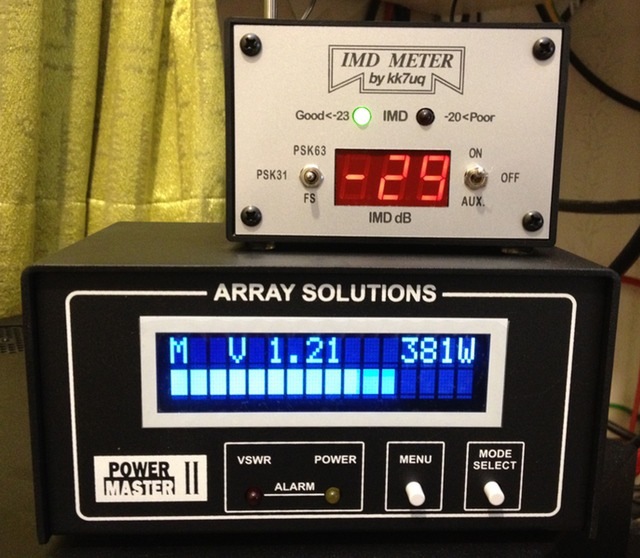 Using the IMD meter by KK7UQ I can run high power and be sure that I’m transmitting a good clean signal that won’t interfere with anyone else using the limited bandwidth we have available. I’m still missing one piece of test gear which I’d like to have. I’d like a good, decent and accurate frequency counter. Ideally I’d like to build a kit but haven’t been able to find anything satisfactory yet so if you have any suggestions then please contact me. 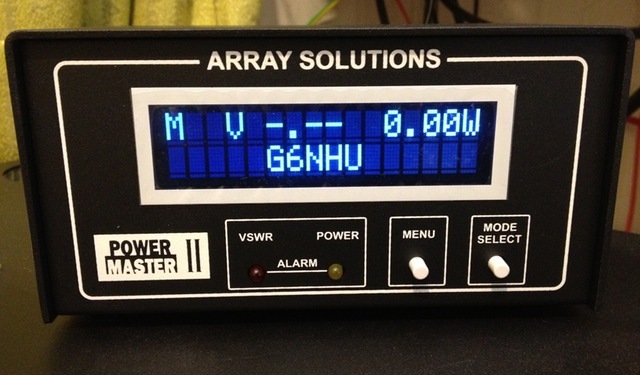 This entry was posted in Amateur radio and tagged Array Solutions, KK7UQ IMD Meter, miniVNA Pro, Power Master II, Shack, Test gear. Bookmark the permalink. For a good 12 digit, 2.5GHz counter & GPS disiplined. I suggest for you to check out ‘Silicone Chip’ magazine, editions December 2012 & Feburary 2013. One of the Elizabeth Amateur Radio Club (EARC) members has built this unit, quite impressive indeed. Now that sounds interesting, Peter. Are these editions available online?